The Poppet and the Lune takes fantasy away from the more typical swords and sorcery and into something more magical and philosophical. Aside from the storyline, the author's lyrical and mellifluous writing style makes this book a pleasure to read. This is a story of a girl who is created from the parts of many children, yet who doesn't know just who or what she is. When the children of a small village are killed by a tragic accident, the parents of the children convince the local witch to bring a new child to life. The witch salvages the undamaged parts of the dead children and makes a patchwork girl, a girl who is then shared by the families of the dead children. She is named Elizabeth by the families, a name which never seems to resonate with her. When the families have other children, they lose interest in the patchwork girl, and eventually, she leaves the village in an attempt to find someplace in which she fits. Meeting Faolin, a somewhat cowardly wereman, she goes from adventure to adventure while trying to discover her place in the world. The strength of this novel is in the wordsmithing. The author turns poetry into prose. The first chapter flows along as if in a song. The words are lovingly selected and placed just so to evoke the strongest reaction and feeling of the reader. The rest of the book flows as well from this outstanding beginning. The patchwork girl, with her mismatched eyes, is one of the most endearing characters about whom I have read in quite some time. I felt for her. I understood her dreams and needs. I wanted to reach into the novel and speak to her, to reassure her. For someone who has a dearth of her own emotions, she emotes to others. And given this lack of emotions, given that she cannot understand something as basic as love, it is amazing that the author is able to create such an emotive and likable character. The other main character, Faolin, while likable, is not quite as believable. While we are told he is afraid not for himself but for the patchwork girl, in fact, he is frightened for himself, given his actions. And his leap at the end of the novel is not as well developed. While I loved the writing, and while I savored every paragraph in and of itself, taken as a whole, I do think the novel could be tightened up a bit. There were a few times where the same thing was repeated over and over when the point was extremely well made the first time is was made. The action sequences were better, though, direct and well-paced. This book is a gem. It is a joy to read, and the patchwork girl is truly an enjoyable heroine. I recommend this to anyone wanting a unique and fresh story of self-discovery. 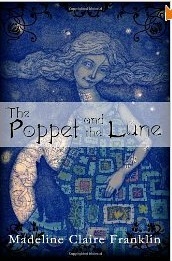 For more reviews or to buy The Poppet and the Lune from Amazon.com, click here.